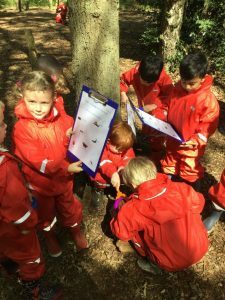 This week the older Nursery children in Acorns class have learnt the sounds: t, I, n and p. They made towers with the Duplo, painted pasta and made necklaces and went on an insect hunt in the woods. Acorns class have been learning all about the Earth. They used balloons to paint blue and green Earths and collaged Earths by scrunching tissue and sticking it down on circles. 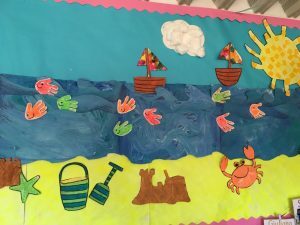 The children in Pippins class have made a wonderful summer display this week. They made handprint fish and painted sand castles and buckets and spades.